To say that Laurie Sullivan has an appreciation for the natural world would be an understatement. 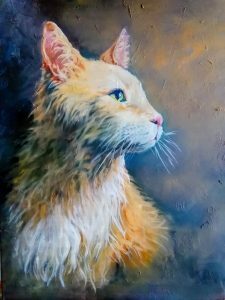 As an avid hiker, lifelong equestrian and master naturalist, Laurie Sullivan strengthens her connections with nature through multiple art mediums including oil paints, acrylics, watercolors, pastel chalks, inks and graphite pencils. 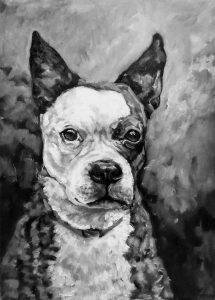 Her work includes pet portraits, equestrian-themed artwork and landscapes. You have been a nature lover your whole life and are an avid hiker, equestrian and naturalist. What is it about nature that you wish to convey with your artwork? The texture, the light, the feeling of being out in a natural environment is what I endeavor to portray. Some artworks are more realistic than others. Can you please describe your process, what inspires you and how you go about choosing your next art project? 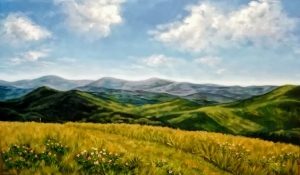 In terms of process I allow the artwork to evolve from my photographs of being outside, from the smallest flower to the largest landscape view, the different aspects appeal to me. The technical process depends upon the art medium. It is fun to dabble in a variety of 2-D art mediums. 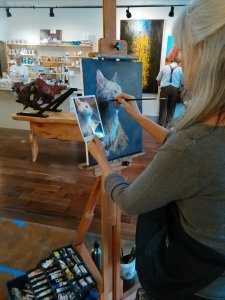 You work with a number of different mediums including oil, acrylics, watercolors, pastel chalks, inks and graphite pencils. How do you decide which one to use? Which is your favorite to work with and why? Frequently the photograph dictates the art medium and it is also fun to combine several in a mixed medium piece. I don’t really have a favorite medium. It is more expressive to use a loose painting style but I am probably known best for my accuracy in the drawing mediums. 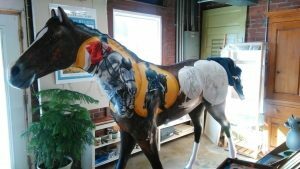 What can you tell us about the life size horse you are painting for the Tryon International Equestrian Center and what do you like most about this project? The two horses that I painted are completed and are no longer in the studio space at AOM. They are on display in Tryon, NC and also Columbus, NC, both on the main streets for each town. The horses were not specifically created for TIEC; they were commissioned for the project called the Art of the Horse out of Tryon, NC. But one of the horses that I painted does show the variety of equine sport disciplines that will be going on during the WEG. 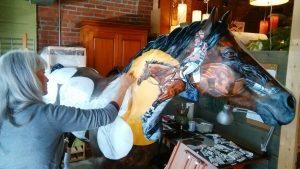 More about the process… Artists submitted designs, and once juried and approved, the artists were then given the fiberglass life-sized horse forms of their choosing to do the paintings on. Once completed, the horses were picked up, taken to an auto body shop for a clear coating to protect them, and then positioned in the towns of Tryon, Saluda, Columbus, NC and Landrum, SC. A map is due out any day to show the location of the horses. Once the World Equestrian Games are completed this fall then the horses will be rounded up and taken to an auction in October. The new owners can display them either in private or public locations. Your commission work is extraordinary! How do you approach your commissions and what should people know about getting a commissioned piece from you? With animals I like to show the personality or a piece of what makes that animal special to it’s owner/partner. A slice of their life so to speak, and portraits can be from action photographs or casual positioning. Contact me through Artisans on Main for more details. My website can provide more samples www.LaurieSullivanArt.com and I have business cards there if someone prefers to contact me directly. If suitable photographs are provided then the cost is discounted by $50 from the listed prices of $300 (small), $400 (medium) or $500 (large). No framing is provided but artwork is generally created so that clients can choose a standard sized frame if they choose to do that. Or drop by Artisans on Main at 14 N. Main St. in Weaverville, NC!